CHANDIGARH, NOV 20 : Global Economic Progressive and Research Association honoured Punjabi University Sports Director. Raj Kumar Sharma with Indira Gandhi National Award for his contribution in sports field in Bengaluru. On birth Anniversary of Late Prime Minister Mrs. Indira Gandhi, every year this organization honoured personals from different areas for their achievements and contribution to the country’s growth with Indira Gandhi National Award. Dr. Raj Kumar Sharma selected in the sports field for his key role in winning Maulana Abul Kalam Azad Trophy eight times for Punjabi University. 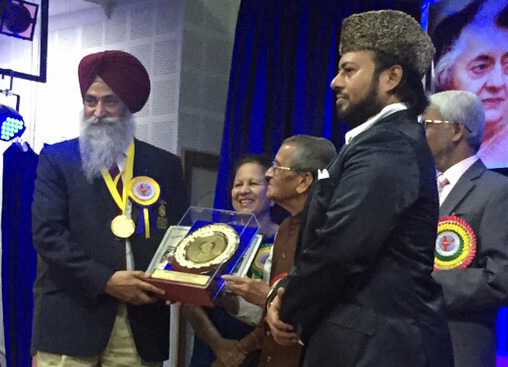 Dr. Raj Kumar Sharma was awarded with Indira Gandhi Award, gold medal and certificate by the chief guest of the ceremony Chief Minister of Sri Lanka’s Eastern Province, former Karnataka Minister and the High Court Justice. Deputy Director Sports Punjabi University, Dr. Gurdeep Kaur Randhawa, Assistant Director, Mohinderpal Kaur, DSO, Fatehgarh Sahib Upkar Singh Virk, DSO Patiala Mrs. Jasvirpal Brar, Darshan Singh, Prinicipal Kulwant Kaur, Principal. Jeet Singh, Former International athlete KPS Brar, Coach Harbhajan Singh Sandhu, Dr. Dalbir Singh Kala Afgana, Prof. Balwainder Kumar and many other personalities congratulates Dr. Sharma.